During the Allied Occupation of Berlin (1945-1994), Doughboy City was where the US Army Infantryman, Specialist Dan Guerra and all US soldiers, based in West Berlin, went to hone their Urban Warfare skills and prepare for when the Soviets and the Warsaw Pact decide to make Khrushchev’s Ultimatum of Berlin a reality. 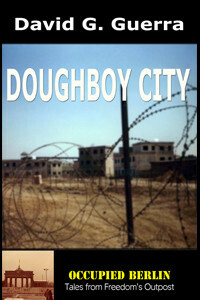 Doughboy City was a mock city with its own subway station, warehouses, apartments, and town hall. One foggy morning, the training turned deadly. The death of his friend was ruled a terrible accident but Specialist Dan Guerra does not buy it and cannot prove why or how or who did it. As the story unfolds, a suspect starts to emerge until it is undeniable but still without proof, Dan Guerra finds himself the target of the suspect’s attempt to get rid of the only person that is stirring the pot and arousing suspicion. From out of the past, an unlikely duo changes everything for everyone. Doughboy City set in the days before the world would change forever, the fall of the Berlin Wall, November 9, 1989. Then again, in Berlin change is an everyday occurrence.